Lennar (NYSE:LEN) is the nation's second-largest homebuilder by market capitalization and number of homes delivered, and has benefited tremendously from the housing recovery of the last several years. Thanks to its profitability and innovative home-selling approach, I believe Lennar is definitely a homebuilding stock to watch. Lennar was the first homebuilder to return to profitability after the market collapsed, and has done well in the years since then. In fact, from 2010 to 2014, Lennar's revenue grew at an average annual rate of 26%, far higher than sector leader D.R. Horton's (NYSE:DHI) annual growth rate of 16.2% during that time period. Even into 2015, the recovery is alive and well, at least where Lennar is concerned. The price of the average home sold by Lennar has increased 12.4% in the past year alone, to $326,000, and the company's gross profit margin has improved from 24.9% to 25.4% as of the end of 2014. In addition, business has surged recently, with 16% more new orders placed year over year in the first quarter of 2015, and a backlog of 21% more homes than at the same time in 2014. One strategy that has worked particularly well for Lennar has been diversified land acquisition, notably buying distressed land owned by banks in the wake of the financial crisis. However, Lennar is shifting away from its focus on land accumulation and toward a more "buy and build quickly" strategy, believing the best opportunities for cheap bulk land purchases might be in the past. I believe perhaps the best reason to keep an eye on Lennar is its innovative homebuilding programs. One thing that differentiates Lennar is its "everything's included" approach -- which is in stark contrast to the design-studio approach still used by the company's major competitors, such as D.R. Horton and Toll Brothers, in which individual upgrades are selected and compromises are often made. Basically, by offering the most popular upgrades (granite countertops, stainless steel appliances, and upgraded HVAC systems, just to name a few) to all of its homebuyers, Lennar can purchase these items in volume and pass the savings on to the customer. The idea is that the customer gets more perceived value, as well as a simplified purchase process, and Lennar creates a high-end product at a favorable cost structure. (Here is an example of one of Lennar's "everything's included" lists.) Because of this and several other reasons, Lennar's average sales price is significantly higher than D.R. Horton's (around $280,000), but with the recent increases in sales volume, it seems like the strategy of "quality over value" is paying off. Another innovation that seems to be catching on is Lennar's Next Gen multigenerational homes, designed to be a "home within a home" for either aging relatives or adult children. Lennar introduced this type of home in 2012 to address a trend toward multigenerational living. According to a 2014 Pew Research report, 18.1% of the U.S. population lived in a multigenerational home in 2012, up significantly from 12.1% in 1980. Basically, the Next Gen homes feature a completely separate home (shown in blue in the floor plan below), which consists of a private entrance, kitchenette, living room, bathroom, and bedroom. Since I last wrote about the Next Gen homes more than a year ago, they have become rather successful. The Next Gen homes are selling for 23% more than the company's average sale price, and sales volume of these homes has grown by 38% over the past year alone, now representing approximately 25% of all homes sold by Lennar. The homes are now offered in 205 communities in 14 states, and they could help Lennar boost revenue and margins in the coming years. And, while some of its competitors are tiptoeing into the multi-generational home market, none are mass-producing this type of home at the scale Lennar is. Valuation and profitability -- time to buy? Lennar is one of the most profitable homebuilders in the market, with a 25.4% gross margin and a 14.9% operating margin in 2014. For comparison, sector leader D.R. Horton's numbers were 21.3% (gross) and 10.1% (operating) during the same time period. 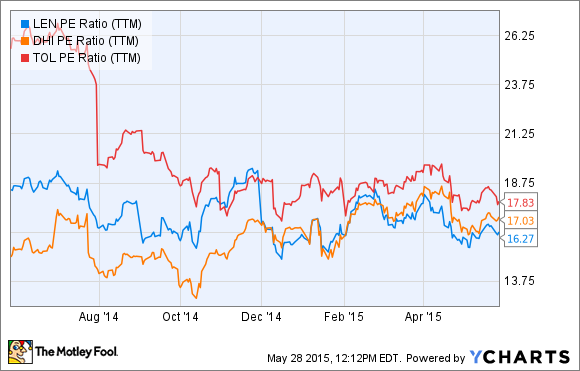 Despite its higher profitability, Lennar actually trades at a lower valuation than its peers. There are a few possible explanations for this, such as Lennar's slightly higher leverage (debt), but I believe Lennar's capability to innovate should keep revenue growing as fast as (or faster than) the overall housing market for years to come. Lennar is definitely a stock to watch, particularly for investors who believe the housing recovery will continue for the foreseeable future.